SHREVEPORT, LA — Student instrumentalists from Centenary’s Hurley School of Music will join the Centenary Youth Orchestra for its spring concert on Sunday, March 4 at 2:30 p.m. in Anderson Auditorium. The concert is free and open to the public and features a program of Mozart, Saint-Saens, and Stravinsky. The opening selection for the concert features soloist Brennen Templeton in Mozart’s Horn Concerto No. 1. Templeton, a Haughton native, was a CYO member in high school and has studied privately with Hurley faculty member Thomas Hundemer for many years. He is currently a freshman at Centenary and is studying composition under Visiting Assistant Professor of Music Dr. James Eakin ’00. Centenary senior pianist Kieley Simonsen will join the CYO to perform Saint-Saens’ delightful Carnival of the Animals alongside her teacher, Dr. Ross Smith. The piece for two pianos and chamber orchestra features short musical vignettes representing various animals, including lions, hens, roosters, tortoises, an elephant, kangaroos, donkeys, a swan, and the inhabitants of an aquarium. There is also a movement entitled “Pianistes” in which they musically portray themselves, feverishly playing scales as fast as they can. Simonsen is a San Antonio native who has served as staff accompanist for the Centenary College Choir, Camerata and the Centenary Suzuki School during her college career. The concert concludes with the haunting “Berceuse,” a lullaby, and triumphant “Finale” from Igor Stravinsky’s ballet The Firebird. These selections are from the 1919 Suite. The ballet and music are drawn from a Russian fairytale which pits the hero Prince Igor against the evil sorcerer-tsar Koschei with the aid of the mythical Firebird. The masterful instrumentation and color of the full orchestra will be on display. 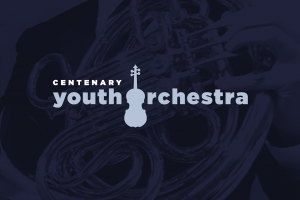 The Centenary Youth Orchestra holds open auditions in the spring and in the fall, at the beginning of the academic school year, for high school and advanced middle school orchestra musicians. The CYO gives its members college-level playing experiences and creates a community among young instrumentalists in Shreveport-Bossier. CYO members have access to optional lessons and theory instruction with Hurley faculty members in Centenary’s state-of-the-art rehearsal and performance venues. For more information about the CYO, contact director Dan Santelices at dtmsantelices@yahoo.com or 318.773.8673.